If you're a seafood fan like us, you'll be happy to hear that October is National Seafood Month. If you're a seafood fan like us, you'll be happy to hear that October is National Seafood Month. We will be highlighting sustainable (and delicious) U.S. seafood with new features, videos, and more. Follow along online using the tag #SeafoodMonth. 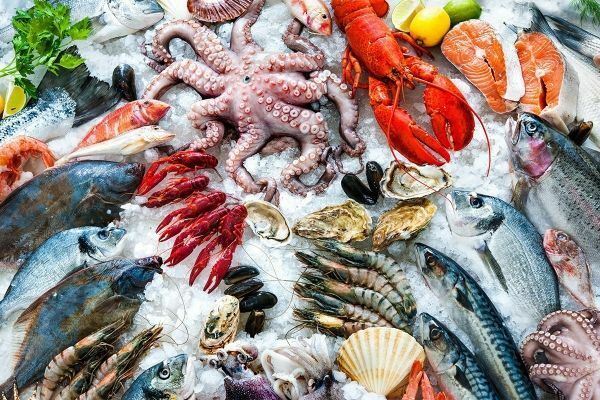 Start by digging into the seafood features below! Visit FishWatch—the nation's database on sustainable seafood—to find up-to-date information on the status of some of the nation’s most valuable marine fish harvested in U.S. federal waters as well as U.S. farmed fish that help meet our country’s growing seafood demand. FishWatch helps consumers make educated seafood choices. National Seafood Month is a perfect time to highlight NOAA’s larger “Blue Economy” initiative as an important guiding force for our seafood future. As a NOAA-wide initiative, the Blue Economy effort touches on many areas of the agency, and three of those areas are especially important for fisheries: continuing to maximize commercial and recreational fishing opportunities, giving greater attention and pursuing involvement in the arena of international seafood marketing and trade, and actively promoting and expanding marine aquaculture. marine aquaculture? From the fishing boat to the plate, we will be showcasing short videos clips of U.S. seafood online each day of October. Tune in!